If you want to ring in the new year with some good original music, then there are two new bands I suggest you go see. The Clear River Tavern’s New Year’s Eve party will be rocking with Acoustic Ruckus at 9:30 p.m. and the Wobbly Barn might need a new roof after Sonic Malfunktion blows it off starting at 6:30 p.m. Both bands also do some cool and unique cover songs. Brown describes the band as this: “We play acoustic but we definitely rock it out. We get loud and we get crazy, almost as much as a full live electric band would. We didn’t want people to think it’s just an acoustic show because it’s certainly not.” Brown does a lot of looping and soloing which leads to a full band experience. He has years of experience as a solo artist and you can also catch him every Tuesday and Wednesday at the K1 Base Lodge at 2 p.m. They last played the Clear on Halloween and it went so well that manager Doug Mianulli had to have them back for New Year’s. They really wanted to be back as well because it’s one of their favorite places to play. Brown says, “We just love it and it’s always such a great crowd. It’s hard to explain but it’s super rootsy and super organic to me. Sonic Malfunktion was the brainchild of Tony Lee Thomas and Jeff Poremski. Thomas met Poremski at Be Music where Poremski is his guitar tech but had no idea he played music. A year or so ago he saw him play bass and thought he was spectacular. Then he saw him play acoustic guitar with Chad Hollister and it blew his mind at how talented he is. With the songs out of the way, then they put together their “Wish List” of possible band mates. Thomas says, “I’m really ecstatic about this project because everyone that is playing in this thing is pretty much our first pick on their instrument. The more people you add to a project, the harder it is to get off the ground. 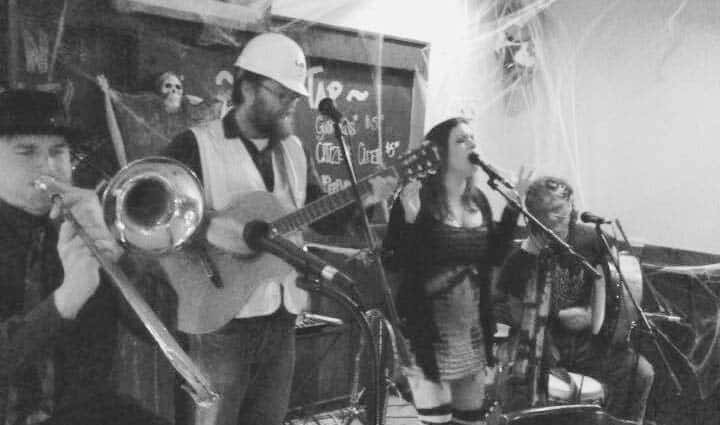 We’re really lucky that it all worked out.” The band is Thomas on acoustic guitar and vocals, Poremski on electric guitar and back-up vocals, Krishna Guthrie on drums, Alex Abraham on bass, JD Tolstoi on keyboard and the horn section of Chazz Canney and Gabby Coughenour. Everyone in this band is in at least one other band so there were challenges with everyone’s timing but they have made it work. Thomas loves the group they got together. “Sometimes you see these all star bands that have all this skill and talent but you don’t always have the best attitudes. Sometimes guys at that level can be a little over confident. So that was our thing, we wanted to get people together that don’t have egos with what they do…One of the criteria was how humble could we all be and work together in a creative way. Put our egos aside without anyone trying to take over.” If you don’t make it to New Year’s Eve, they will be playing every Thursday night for Locals Night at the Wobbly Barn starting Jan. 21.